Can the Natural Feedback Creator pedal deliver on its promise? DigiTech's NAMM 'board: a proper Freq show. 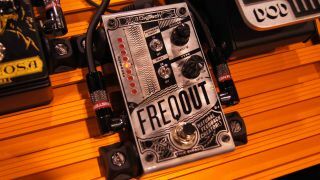 NAMM 2017: We have to admit, when we first caught wind of the FreqOut Natural Feedback Creator, we weren't expecting much: we've played 'feedback' pedals before, and they've amounted to little more than infinite sustain. Forget everything you know, however: the FreqOut redefines what a feedback pedal - and feedback itself - can be. Another riff on DigiTech's Whammy technology (like the Ricochet and Drop), the FreqOut claims to provide "sweet, natural feedback at any volume" - and the thing is, it actually delivers. We were able to spend a good 20 minutes with the pedal at the DigiTech stand, running through DOD's Carcosa fuzz, as well as DigiTech's new CabDryVR and a set of headphones, yet we were conjuring the kind of feedback you'd normally require a fully cranked amp and cab setup to produce. A choice of intervals allows you to determine the type of feedback you want, from piercing squeals to thundering lows, while 'natural high' and 'natural low' settings still allow for an element of unpredictability, just like the real thing - but unlike most actual feedback, it works effortlessly with clean signals, too. You can engage the pedal via a momentary footswitch for quick bursts, or leave it on, allowing the FreqOut's onset knob to determine how long before the harmonics kick in - perfect for performing quick-fire riffs before ushering in a thunder of feedback to accompany that suspenseful chord. Better yet, a toggle switch allows you to disengage the dry signal, and in this mode, sliding notes around the fretboard yields a flute-y, EBow, theremin vibe - it's more akin to a vocal synth than raw guitar fury. From our limited time with the pedal (and trust us, we could have stood there for hours just playing the intro to Soundgarden's Loud Love), we quickly came to the conclusion that the FreqOut capably stands apart from anything that has come before it; this is a genuinely new and innovative effects pedal. While the effect itself has been around since the dawn of the electric guitar, the FreqOut changes your approach to playing and fosters an appreciation for feedback as a device within songwriting and performing - for anyone missing the fiery response of real live amps while recording with plugins, it could prove to be essential. Major kudos to DigiTech for bringing something new to the table - we're Freqing Out over here.